My last set of graphs shows the decline of C corporations since the 1980s while the share of pass-through businesses increased. Pass-through businesses do not pay taxes through the corporate tax code but through individual tax code. 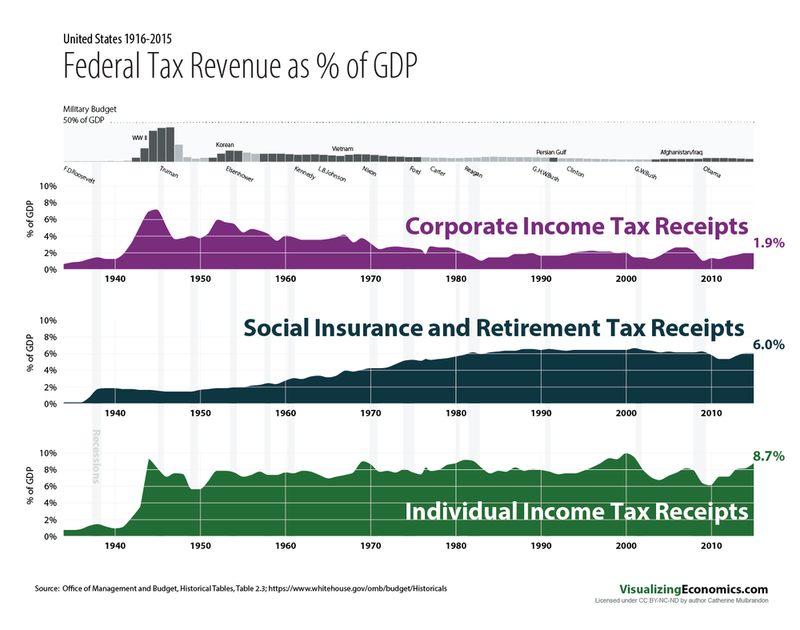 Here are the three main sources of federal revenue (% of GDP) and you can see how corporate income tax receipts were greater in the decades between 1940-1980 but with very little change in the individual income tax receipts. You can follow me on Twitter, Facebook, Tumblr, Instagram, Feedly, or RSS. Have Questions? Ask Me. Unless otherwise noted, the data visualizations are mine and are licensed under a Creative Commons Attribution-NonCommercial-NoDerivatives 4.0 International License. Feel free to repost the graphics on your site send me some new fans with a link and attribution: Created by Catherine Mulbrandon at VisualizingEconomics.com Contact the original makers of the graphic for everything else.